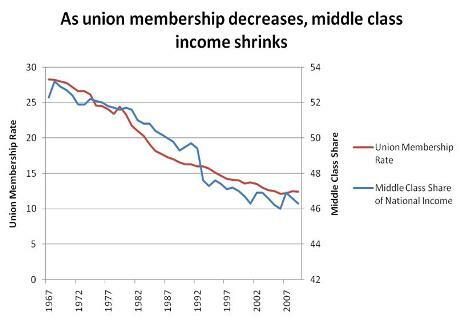 The U.S. middle class has always had a special mystique. It is the heart of the American dream. A decent income and home, doing better than one’s parents, and retiring in comfort are all hallmarks of a middle-class lifestyle. Contrary to what some may think, however, the U.S. has not always had a large middle class. Only after World War II was being middle class the national norm. Then, starting in the 1980s, it began to decline. President Donald Trump has portrayed the tax plan Congress is wrapping up as a boon for the middle class. The sad reality, however, is that it is more likely to be its final death knell. To understand why, you need look no further than the history of the rise and decline of the American middle class, a group that I’ve been studying through the lens of inequality for decades. The middle class, which Pew defines as two-thirds to two times the national median income for a given household size, began to grow after World War II due to a surge in economic growth and because President Franklin Delano Roosevelt’s New Deal gave workers more power. Before that, most Americans were poor or nearly so. For example, legislation such as the Wagner Act established rights for workers, most critically for collective bargaining. The government also began new programs, such as Social Security and unemployment insurance, that helped older Americans avoid dying in poverty and supported families with children through tough times. The Home Owners’ Loan Corporation, set up in 1933, helped middle-class homeowners pay their mortgages and remain in their homes. Together, these new policies helped fuel a strong postwar economic boom and ensured the gains were shared by a broad cross-section of society. This greatly expanded the U.S. middle class, which reached a peak of nearly 60 percent of the population in the late ‘70s. Americans’ increased optimism about their economic future prompted businesses to invest more, creating a virtuous cycle of growth. Government spending programs were paid for largely with individual income tax rates of 70 percent (and more) on wealthy individuals and high taxes on corporate profits. Companies paid more than one-quarter of all federal government tax revenues in the 1950s (when the top corporate tax was 52 percent). Today they contribute just 5 percent of government tax revenues. Despite high taxes on the rich and on corporations, median family income (after accounting for inflation) more than doubled in the three decades after World War II, rising from $27,255 in 1945 to nearly $60,000 in the late 1970s. Rather than supporting workers – and balancing the interests of large corporations and the interests of average Americans – the federal government began taking the side of business over workers by lowering taxes on corporations and the rich, reducing regulations and allowing firms to grow through mergers and acquisitions. Since the late 1980s, median household incomes (different from family incomes because members of a household live together but do not need to be related to each other) have increased very little – from $54,000 to $59,039 in 2016 – while inequality has risen sharply. As a result, the size of the middle class has shrunk significantly to 50 percent from nearly 60 percent. One important reason for this is that starting in the 1980s the role of government changed. A key event in this process was when President Ronald Reagan fired striking air-traffic control workers. It marked the beginning of a war against unions. The share of the labor force that is organized has fallen from 35 percent in the mid-1950s to 10.7 percent today, with the largest drop taking place in the 1980s. It is not a coincidence that the share of income going to earners in the middle fell at the same time. In addition, Reagan cut taxes multiple times during his time in office, which led to less spending to support and sustain the poor and middle class, while deregulation allowed businesses to cut their wage costs at the expense of workers. This change is one reason workers have received only a small fraction of their greater productivity in the form of higher wages since the 1980s. Meanwhile, the real buying power of the minimum wage has been allowed to erode since the 1980s due to inflation. While the middle class got squeezed, the very rich have done very well. They have received nearly all income gains since the 1980s. In contrast, household median income in 2016 was only slightly above its level just before the Great Repression began in 2008. But according to new unpublished research I conducted with Monmouth University economist Robert Scott, the actual living standard for the median household fell as much as 7 percent due to greater interest payments on past debt and the fact that households are larger, so the same income does not go as far. As a result, the middle class is actually closer to 45 percent of U.S. households. This is in stark contrast to other developed countries such as France and Norway, where the middle class approaches nearly 70 percent of households and has held steady over several decades. So how will the tax plan change the picture? France, Norway and other European countries have maintained policies, such as progressive taxes and generous government spending programs, that help the middle class. The Republican tax package doubles down on the policies that have caused its decline in the U.S. Specifically, the plan will significantly reduce taxes on the wealthy and large companies, which will have to be paid for with large spending cuts in everything from children’s health and education to unemployment insurance and Social Security. Tax cuts will require the government to borrow more money, which will push up interest rates and require middle-income households to pay more in interest on their credit cards or to buy a car or home. The benefits of the Republican tax bill go primarily to the very wealthy, who will get 83 percent of the gains by 2027, according to the Tax Policy Center, a nonpartisan think tank. Meanwhile, more than half of poor and middle-income households will see their taxes rise over the next 10 years; the rest will receive only a small fraction of the total tax benefits. While Republicans justify their tax plan by claiming corporations will invest more and hire more workers, thereby raising wages, companies have already indicated that they will mainly use their savings to buy back stock and pay more dividends, benefiting the wealthy owners of corporate stock. So with most of the gains of the $1.5 trillion in net tax cuts going to the rich, the end result, in my view, is that most Americans will face falling living standards as government spending goes down, borrowing costs go up, and their tax bill rises. This will lead to less economic growth and a declining middle class. And unlike the virtuous circle the U.S. experienced in the ‘50s and ’60s, Americans can expect a vicious cycle of decline instead. First published in The Conversation. Included in Vox Populi with permission. Steven Pressman is a professor of economics at Colorado State University. This entry was posted on December 21, 2017 by Vox Populi in Opinion Leaders, Social Justice and tagged GOP tax plan doubles down on policies that are crushing the middle class, Steven Pressman.